This project guides you through the process of black chrome plating on brass. In order to plate black chrome successfully onto brass, it’s necessary to first plate a layer of white bronze, because black chrome reacts with the copper and zinc in brass and contaminates the plate. Before you start, you’ll need to mix up the required amount of black chrome plating solution, referring to the 'Mixing Black Chrome Plating Solution' page in this guide, along with a quantity of white bronze plating solution, referring to the 'How to prepare white bronze plating solution' page. You should mix the black chrome plating solution in an environment that is at room temperature (minimum 25 degrees centigrade). You should use a carbon electrode for all the plating in this project. 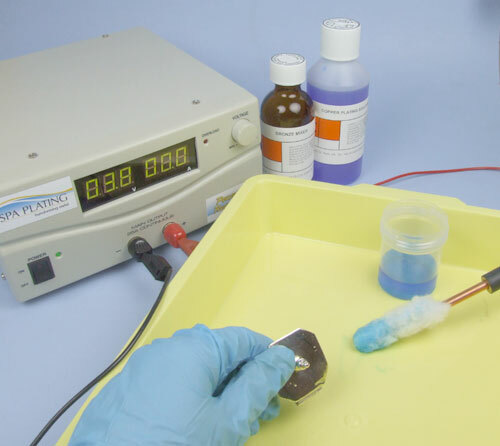 This project also demonstrates how useful the conductivity tester can be in saving you time before you start plating. 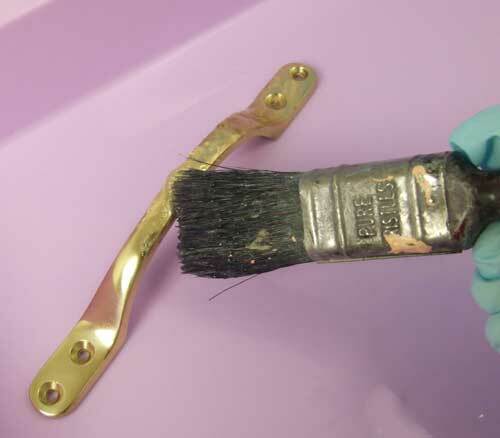 Solutions; Copper Brush Plating Solution, pre-prepared white bronze plating solution (please see the ‘How to prepare white bronze plating solution’ page in this guide), Black Chrome A and B. 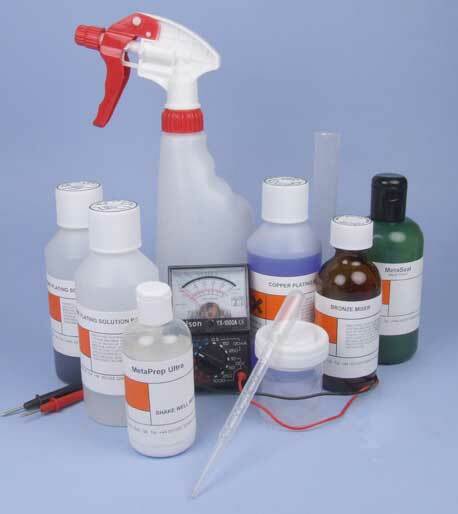 Equipment; Conductivity Tester, spray bottle, beaker, 25ml measure, 2 Electrode Handles, one fitted with a either a Platinum or Carbon Electrode for the white bronze plating, the other with a Carbon Electrode for the black chrome plating. Polishes/cleaners; MPU, MetaSeal. 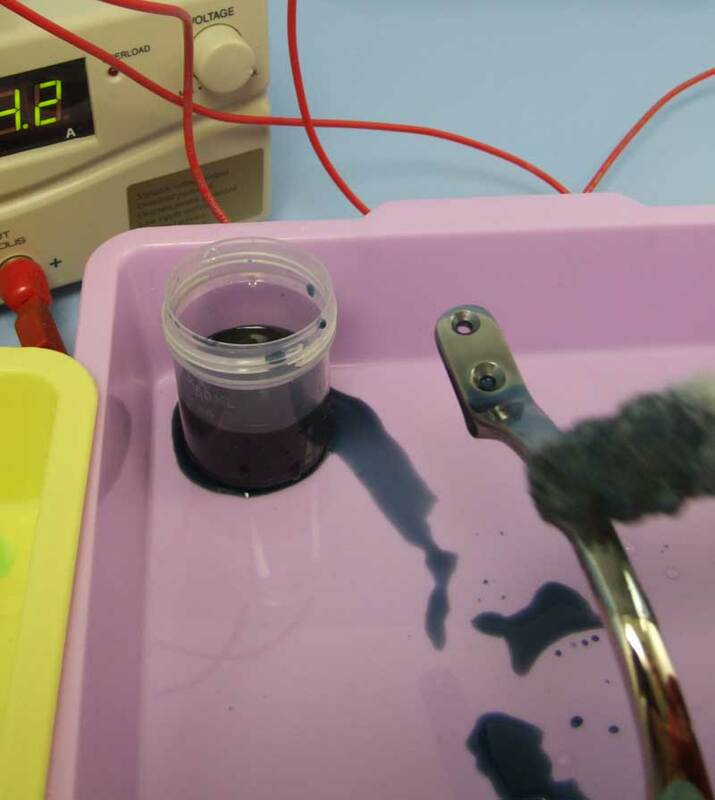 Before you start, check that the surface you’re plating is conductive. This is particularly important if the object you’re plating is a decorative item that is designed to be handled regularly, as these items are often coated with a protective layer of lacquer to prevent tarnishing. This layer will stop any plating taking place and will be detected by the conductivity tester. If this is the case and your item is coated with lacquer, proceed to the next step. If not and the needle on your tester shows the surface to be conductive, go straight to the fourth stage. Strip the lacquer off with the same kind of preparation you would use to strip household paint from doors or varnish from floors. We suggest that you do this twice, to be absolutely sure that you’ve removed all traces of lacquer. 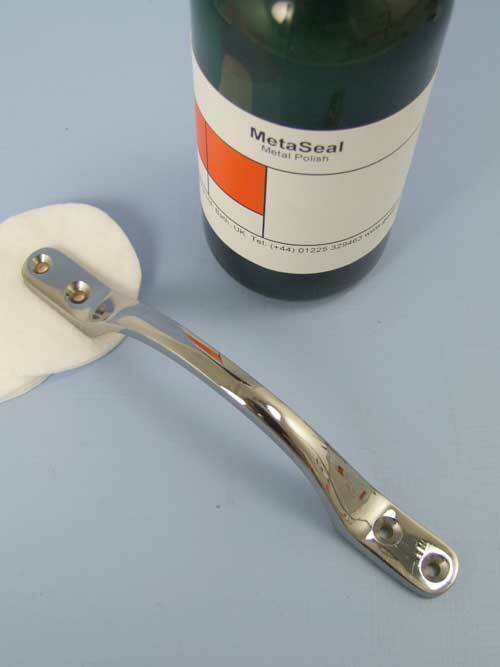 Clean thoroughly with MPU and then test again with the Conductivity Tester, before you start plating. Remember to fit a platinum or carbon electrode into your electrode handle, using the allen key supplied with the electrode handle kit. 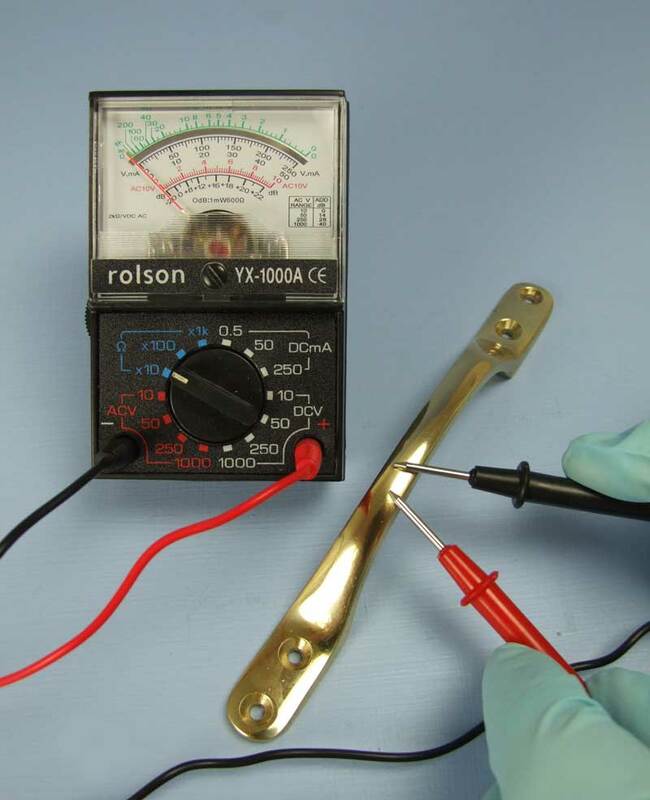 Adjust the voltage if necessary and start plating with the usual circular strokes of the swab. Adjust the voltage to 8 volts and start plating with regular, circular strokes.Try to touch the crocodile clip to a part of the surface of the item which is out of sight, as it might leave a small, black mark. Alternatively you could use one of our Conductor Strips, which can be purchased from our website. To bring out the high shine in the black chrome, polish with MetaSeal.